The Nepalese government showed leadership in the aftermath of the quake, but faces serious long-term challenges. With initial recovery stages complete or underway, sufficient time has passed since the Nepal earthquake to reflect on deeper structural causes and institutional failures. The continuing crisis has attracted global attention and placed developed world organizations face-to-face with Nepal’s own weakened governance capacity. While aid management is an immediate concern, institutional reforms are needed to build longer-term resilience. Discussions about recovery and reconstruction have increasingly focused on aid and its effective use, by both the government and international agencies. Misuse of recovery funds after the 2010 Haiti earthquake was recently publicized. Comparisons to Nepal quickly followed, particularly on social media. The default assumption is that aid effectiveness is already an unattainable goal. Massive flows of donations and aid typically follow any disaster. According to Richa Shivakoti, a Singapore-based migration analyst, in developing countries like Nepal donors often have little trust in the government’s management of funds. Therefore, many donate directly to international aid organizations such as the Red Cross, the UN, Save the Children, and Médecins Sans Frontières. Soon after the earthquake, the Nepali government, international agencies, and citizen groups made separate appeals for immediate relief. For example, the UN’s Office for the Coordination of Humanitarian Affairs (OCHA) issued a flash appeal for recovery support, requesting $422 million (of which 46 percent has been collected to date). The Nepali government requested that donations be made through the Prime Minister’s Disaster Relief Fund, but skepticism soon emerged regarding the fund’s management effectiveness, according to Shivakoti. While international agencies are often preferred by donors, they do not have the same institutional and operational reach as governments, and must sub-contract to local partners to execute relief strategies. These agencies also lack the same scope of responsibility and degree of accountability as governments do, particularly regarding transparency (a popular topic amidst rising political contention). During a recent government-organized reconstruction conference, high-level representatives from more than 50 countries and multilateral agencies pledged more than $4.4 billion (although the government had estimated need at around $7 billion). Shivakoti states that while such efforts appear to be as a positive sign, pledges in other post-disaster cases often suffer delays and even fail to materialize. It remains to be seen whether the Nepal case will be different. The government’s declining credibility regarding recovery management may compromise efforts to solicit additional donations. Good faith measures must aim to meaningfully (and visibly) improve disaster preparation and general governance conditions. Nepal now faces the arduous task of strengthening institutions, building capacity, and improving disaster management policies. 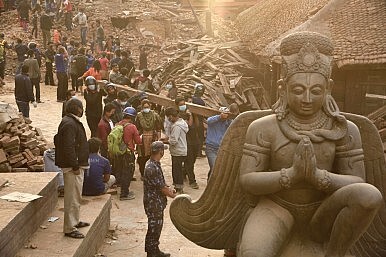 According to Aditi Raina, a Singapore-based analyst focusing on Nepal, the Nepalese government responded swiftly and displayed leadership in the immediate aftermath of the earthquake, but long-standing deficiencies persist in Nepal’s institutional strength and governance capacity. This is particularly evident in the past decade of urban growth. Nepal is among the least urbanized countries in the world, with only 17 percent of its population living in cities. However, it is also one of the fastest urbanizing nations, with an average yearly urban population growth rate of 6 percent since the 1970s. This increasingly unmanageable growth has occurred amidst political instability. Local elections have not been held since 1997, and Kathmandu has been without a local government for more than a decade. The city is, by default, run by bureaucrats with little or no accountability to citizens, according to Raina. These institutional failures are reflected in Kathmandu’s chaotic state of disrepair, further strained by the continuing influx of rural migrants after the decade-long Maoist insurgency (1996-2006). The Nepali government has had trouble managing these challenges, leading to rapid and haphazard urban growth. Kathmandu now faces challenges long familiar in the West: sprawl, pollution, traffic congestion, and even a looming energy crisis. The city is also beset with poor waste disposal and sewage systems. The immediate region’s seismic vulnerability, well known and comparable to that of Haiti, compounds the threat of such shortcomings. Raina argues that in the face of this overwhelming evidence, failure to address growth of substandard and unplanned development is reflective of government apathy and poor regulatory enforcement. Currently, there is space for capacity building within District Development Committees, which consist of several Village Development Committees (VDCs) that operate at ward-levels. According to Raina, VDCs can be a platform to strengthen grassroots networks focused on monitoring urban housing and commercial developments, improving disaster risk management, and supporting regulatory enforcement. Frontiers of capacity may therefore lie at the local rather than national level, as increasingly impatient citizens take charge of their own recovery and development fate. The way forward for Nepal is no mystery. The international community and NGOs have proven their willingness to help. Despite the apparent ease with which evidence-based policymaking can and should occur, progress is often derailed at the implementation stage, as evident in the poor enforcement of the National Building Code. The political will to adopt meaningful regulations is lacking, and corruption stubbornly endures. Even an event the scale of an earthquake cannot be assumed to catalyze institutional reform. Governance improvement will be hard-won and time-consuming. In confronting the immediate challenges of disaster recovery, Nepal must not lose sight of the work needed to improve institutional conditions for the long-term. This requires a concerted effort by political leaders to adopt reforms, even if they disrupt the status-quo. Sadly, in a politically gridlocked nation unable to establish a constitution for two years running, a genuine commitment to good governance is as unlikely as it is necessary. Those championing such an effort, particularly in the face of opposition by entrenched interests, will be viewed by history as visionary reformers. The way forward, then, requires not only resources but strong and courageous leadership. Who will step up?